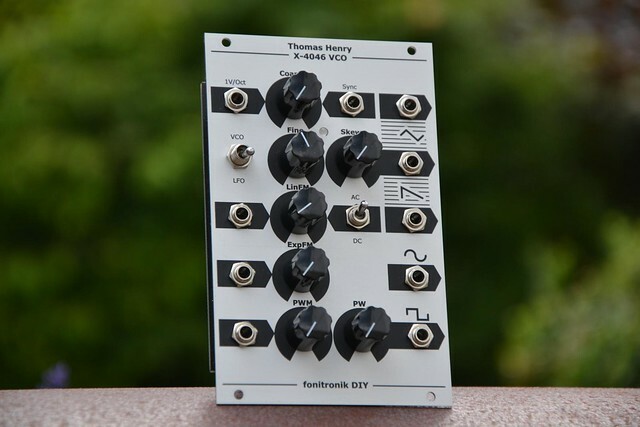 from time to time people ask me about the Thomas Henry X-4046 VCO and if i would do another run. I think this is due to the fact that this VCO is rather unique. Thomas did an awesome job in utilizing this 4046 IC for a musical VCO with 1V/oct response - something this IC has not been designed for. 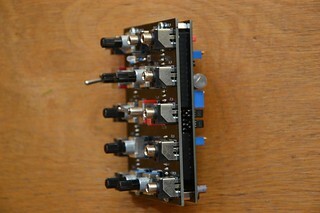 and the result is a VCO with great features and character. now i decided to do a new design. the prototype PCBs came in recently, i assembled them and they work perfectly. if there was enough interest i would offer them together with a top notch front panel in professional quality, as i did for the 555-VCO. 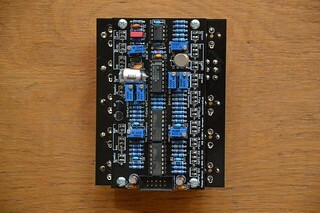 there will be one PCB containing the actual VCO circuitry, providing MTA-100 footprints for easy manual wiring (if needed/desired), a combined footprint for super matched pairs or your hand matched 2N3904, and another additional adapter PCB carrying the front panel components (eurorack form factor), which could be mounted piggyback to the VCO PCB. 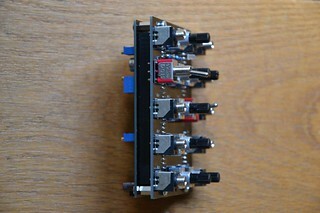 the adapter PCB provides an LFO modification as well (mode switch, bi-color LED and LFO timing cap). PCBs and panels will be ready for delivery early AUG then. i am taking no money u ntil the boards/panels are in. i will then contact all who indicated serious interest. 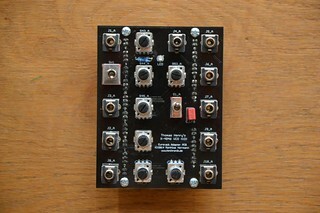 3 x bare eurorack adapter pcb (international shipping). Went out for holidays and missed that one. 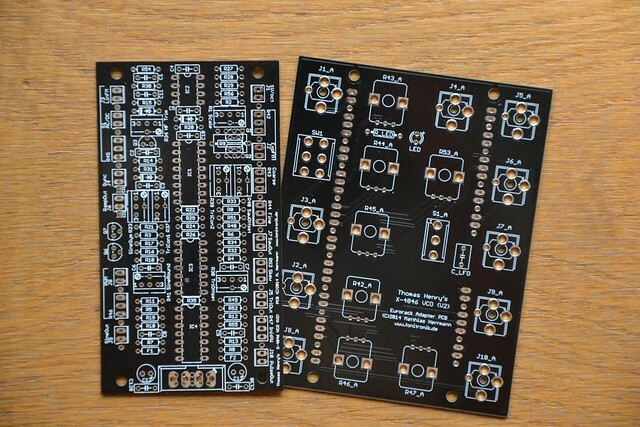 I know it´s too late, but if you order extra/spare pcb´s, I´d like a pair of main pcbs if possible. We ALL missed it Matthias! would have taken 4 or so... did you close down the order for this? there will be an option for you all, soon. stay tuned. Just got my boards today--thanks!! I'm wondering if you have docs for this revision yet. A BOM would be very helpful--or do all the parts/part numbers correspond to the parts list at scott stites's site? today i learned that the main board layout exceeds the manufacturers tolerances. my fault. so by now one case has been reported where this led to an actual problem. the middle pin of the coarse pot connector is not only connected to the 100k input resistor (R29), but to the 2k PTC as well (at the opamps output node). if this happens, everything but the coarse pot will work fine. - cut the trace from the middle pin of the coarse pot connector to R29 on the top layer. - for R29 solder only the leg towards the IC to the board. - solder a wire from the middle pin of the coarse pot connector to the unsoldered leg of R29.